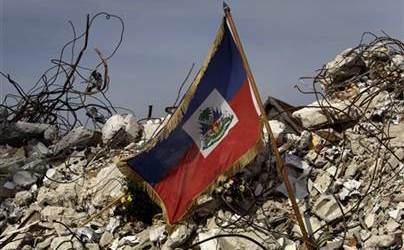 PORT-AU-PRINCE (Reuters) – French President Francois Hollande pledged to pay back a “moral debt” to Haiti during a visit on Tuesday to the impoverished Caribbean nation founded by former French slaves who declared independence in 1804. His visit marked the first official visit by a French president to the hemisphere’s poorest country, a former colonial jewel still bitter over a debt France forced Haiti to pay in 1825 for property lost in the slave rebellion. “We cannot change the past, but we can change the future,” Hollande said, speaking at an event with Haitian president Michel Martelly on Port au Prince’s Champ de Mars, in the city center near the presidential palace that was destroyed by a 2010 earthquake. “There is a moral debt that exists,” said Hollande, dodging the thorny issue of reparations which some in Haiti have demanded. Martelly said the 150 million francs paid to France, valued today at about $20 billion (18 billion euros), was a “grave injustice” that prevented Haiti from developing as fast as others. While Haiti had not “forgotten” the past Martelly did not push the debt issue. “Our country needs services more than any amount of money for people to fight over,” he said. “The time of resentment has long passed. France has a place in the hearts of all Haitians,” Martelly added. Hollande said France will spend $145 million (130 million euros) over the next five years on development projects in Haiti, including $56 million (50 million euros) on education. Hollande also urged Haiti to hold long-overdue legislative elections. The first round of votes is scheduled for August 9. “Democracy is indispensable to the development of Haiti,” he said. At the day’s formal ceremony, Hollande laid a wreath of white flowers at the statue of Toussaint Louverture, the Haitian revolutionary hero who died in a French jail. A few dozen clashed with riot police, who blocked them from entering the cordoned off areas. “It’s a crime to force Haiti to pay a debt. It’s criminal to pay the former master,” said Lavenia Laguerre, a woman wearing a shirt with the logo of the political party Petit Dessalines, named after a former military officer who led the rebellion against France.